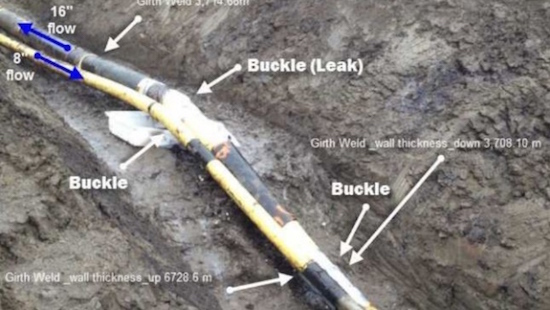 A report for Husky Energy included images of the damaged section of pipeline. Efforts to complete the clean-up of last July’s Husky oil spill in the North Saskatchewan River started back up Monday. Canadian authorities will continue to monitor the shorelines of the river and remove oil from any areas suffering an impact. AK Underwater Pipeline Leak Started in Dec. The spill was discovered July 21 and by then, about 225,000 liters of oil had already spilled. A November report found ground movement, described as geotechnical activity, was the reason a section of Husky Energy pipeline ruptured, spewing oil into the North Saskatchewan River and imperiling water sources for thousands of residents in communities downstream of the leak. Before cleaning had stopped last year, approximately 210,000 liters had been accounted for and cleaned, according to Wes Kotyk, assistant deputy minister with the Saskatchewan government’s environmental protection division. One area located approximately 18.5 kilometers from the origin area of the spill has been identified as needing attention, Kotyk said. Oil first hit the river about 50 kilometers northeast of Lloydminster, Saskatchewan. “They will go as far [down river] as until they identify that there is no more impacts,” Kotyk said. “Anything that is recoverable, will be,” he said of the potential remaining oil. An additional wildlife assessment will end up conducted, as well as community engagement. “We haven’t been made aware of any new impacts to wildlife,” he said. A submerged and sunken oil group will be part of clean-up efforts this year. The group will conduct a study “to determine where, and if and how much [oil] there is, and then to determine how best to recover that, if it is recoverable even,” said Kotyk. Costs associated with reclamation is Husky’s responsibility, Kotyk said. The province is responsible for oversight and monitoring of the situation. The spill affected the drinking water of nearby communities, such as Prince Albert and North Battleford, as well as seeped onto the shores of the James Smith Cree Nation. Officials said about 60 percent of the spill ended up contained on the ground.